Jack Herer most readers don’t know the whole story; Herer’s efforts resulted in much more than a strain of pot named after him. Herer’s famous book, The Emperor Wears No Clothes, launched this Buffalo-raised Californian to fame. 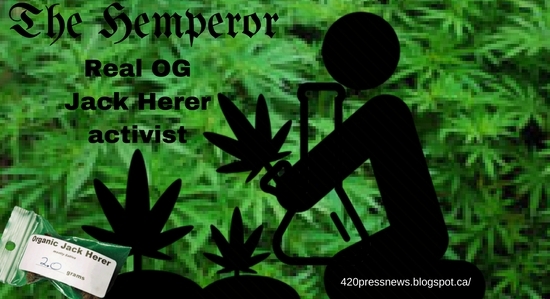 The activist known as “the Hemperor” was also the subject of the 2005 documentary Emperor of Hemp, bringing his enlightened message of hemp legalization and environmentalism to an even wider and more mainstream audience. In 1973, on the advice of his friend Ed Adair, Herer began collecting information about hemp and cannabis for a book. Twelve years later, in 1985, he published the first edition of The Emperor Wears No Clothes. The ground-breaking book precisely documents the politics and bigotry that led to the federal-level prohibition of cannabis in the United States in 1937. The Emperor Wears No Clothes has also been embraced by environmentalists for its focus on the thousands of uses of hemp, including its role for food, clothing, housing, fuel, and medicine. This pioneering activist famously offered $100,000 to anyone who could disprove any part of his book. Herer’s book was so well researched, however, that no one ever took him up on the offer. Most casual tokers are unaware that Herer gave much more to the cannabis culture than merely a best-selling book about hemp. In 1998, the tireless activist was shown a unique aluminum pipe in Jacksonville, Florida. “Each hit was the perfect hit. But there was a problem; it got hotter and hotter and hotter and hotter,” Herer told me during an interview from his Northern California home in 2006. Coincidentally, Herer owned a small pipe company at the time. This enabled him to experiment with a variety of designs. He was obsessed with creating a pipe that avoided the heat buildup of the aluminum model he discovered in Florida. Herer explained how standard single-hole pipes burn up to 30% of a gram of cannabis in only one or two hits. Herer and one of his sons have sold more than 30,000 of the pipes. The unique paraphernalia is marketed as a “double barrel, double venturi, ricocheting vortex” effect pipe and is available in a limited number of head shops on the West Coast and from a few online vendors. Jack Herer is a Sativa-dominant strain that combines a haze hybrid with a Northern Lights #5 and Shiva Skunk cross. It was bred by Sensi Seeds in Amsterdam, with the participation and permission of Herer. During one of my interviews with the famous activist, he explained how the company offered him either a percentage of the seed sales of the strain or the red carpet treatment when Herer was visiting Amsterdam, then the epicenter of European cannabis culture.